Harris Wash offers an easy route to the Escalante River and is popular with both people and cattle - many visitors hike the lower 10 miles, usually on overnight backpacking trips, while the upper stretches are grazed extensively all year. 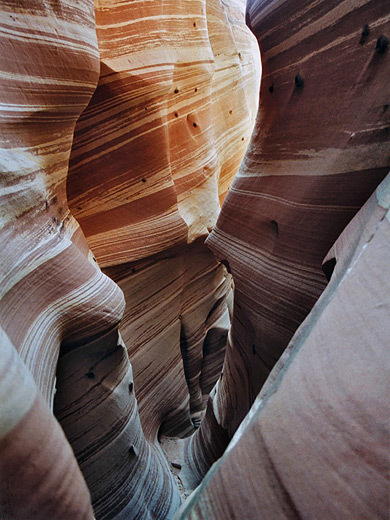 The canyon becomes 1,200 feet deep and has impressive streaked Navajo sandstone walls, large rock alcoves, pools and year-round flowing water in the lower reaches which sustains many trees, bushes and flowers. 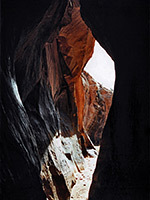 It has no obstructions and although never very narrow, some of its tributaries are true slot canyons and are much less often visited, as the best ones, which are characterised by unusual rock colours and textures, start upstream of the regular trailhead. Harris Wash is just about the longest tributary of the Escalante River - it starts high in the Kaiparowits Plateau, where it is known as Alvey Wash and is followed for a while by the upper end of Smoky Mountain Road. The stream flows northwards to Escalante town then turns abruptly southeast, runs close to UT 12 for a while and crosses the Hole-in-the-Rock Road at mile 4 where it changes name. Harris Wash meets the main river after another 20 miles and the hike can begin from this point, but the usual starting point is further downstream, reached by a side road - see the location section of Red Breaks for details. For exploring the upper tributaries, there are two options for the approach - either walk down Harris Wash starting from the main road, or take a short-cut along a tributary (Halfway Hollow), which meets the road 3.5 miles further south. 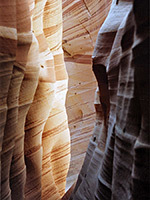 10 views of Harris Wash and side canyons. TopoQuest topographic map of upper Harris Wash; Zebra Slot is just southeast of '24', while Tunnel Slot is the next tributary east. There is not much to see in upper Harris Wash. 1.8 miles east of the Hole-in-the-Rock Road, Big Horn Canyon joins from the north - this is a long drainage with two branches and plenty of interesting narrow sections. Continuing downstream, the main wash remains quite wide and the stony streambed winds between grassy sandbanks, sometimes past sheer cliffs with occasional small overhangs while at other places the sides are much less steep. 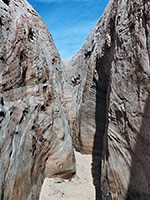 Several very short, curving slot canyons join from the north but the next worthwhile tributary is not reached for 4.3 miles (or 2.4 miles via Halfway Hollow), at a point where the wash becomes rather wide and turns due south, just before the junction with Halfway Hollow - this is the second main side canyon to the south, the other being Cottonwood Wash.
A short walk up a wide sandy gully enters what has become known as Zebra Slot. The stone walls quickly constrict and the rock coloration changes from plain greyish red to pretty, delicately striped white/orange bands - an unusual combination, and very photogenic. The canyon becomes extremely narrow and twisting but is blocked after only about 100 yards by a near vertical dryfall that rises 10 feet then beyond and higher still are 2 deep, linked potholes. Above these the canyon is much shallower and although it is not easy to progress beyond here, it can be viewed by climbing above on the right, starting from the entrance to the narrows. In wet weather, parts of Zebra Slot have quite extensive pools. One mile further down Harris Wash, the next drainage on the north side is another short, unusual slot canyon - named Tunnel Slot it has a cave-like passage of 50 yards through high cliffs; the opening is 2 yards wide at stream level but only a few inches across higher up. It is filled by a deep pool most of the year and usually needs wading or even swimming, but a visit in early November found water only 6 inches deep. The passage beyond soon opens out and is filled with trees and bushes - it then bends sharply to the east and doesn't continue too far. The tunnel is reached after a walk of 5 minutes from the main canyon. After another half mile eastwards a larger unnamed tributary joins Harris Wash from the north. The lower part has several springs and so is quite overgrown but beyond a short rocky section a pleasant open sandy canyon extends for some distance perfectly straight - not especially narrow but with colorful bushes and generally crisp, peaceful scenery. The main Harris Wash trailhead, the point for hikes to the Escalante River, is reached after 60 more minutes brisk walking downstream after the entrance to this canyon (another 4.3 miles), and begins opposite the end of Red Breaks, another long, colorful drainage. The walk from here to the river along the ever-deepening gorge takes between 4 to 8 hours and is quite easy - some parts are along an old wagon track, and even the watery sections are shallow and level.